A new mural in Christchurch Women's Prison, depicting tussocks on rolling sand dunes set against brooding skies, developed new skills and a sense of achievement among the women involved in the four-month project. The prisoners, just weeks into the Growth and New Beginnings Mural Project, would never have guessed the impact that the first Christchurch earthquake was to have on their lives and work. There was much to absorb in the days and weeks after the September 2010 earthquake as prisoners were relocated temporarily. The work was to offer new meaning for its makers when they eventually returned to it. Christchurch artist and prison art tutor Corina Hazlett has worked at Canterbury Prisons for 14 months. The idea for the mural was one she had used before with cancer patients. She wanted to develop a similar collaborative work with prisoners at Christchurch Women’s Prison. Growth and New Beginnings was made for the gymnasium at Christchurch Women’s Prison, replacing the existing 20-years-old mural with its fading colour and images belonging to that earlier time. Creating the mural posed several challenges. For one thing, it needed to be large enough to have a presence on the massive back wall of the gym. And then there was the time needed to complete such a large work within the busy hours of the 8am to 5pm prison regime. Growth and New Beginnings is a huge, six-metre by four-metre triptych of three canvas panels. The focus of the work is the landscape of Aotearoa New Zealand: mountains, ocean, sky and rich, rolling sand dunes. The mural project was open to all the women, whether they considered themselves artists or not. Those contributing thought about the things they considered important and then produced working drawings that formed the basis of individual pieces woven into the mural. 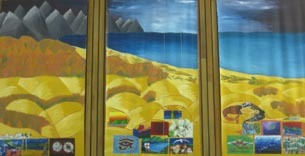 The Self-Care Unit at Christchurch Women’s Prison played a major role in the mural development and took responsibility for painting the background. The unit was a suitable space, large enough for the three panels to be painted and left out to dry. “The process of making the artwork was a rich and rewarding experience,” Corina says. “We developed an environment of trust and out of that there was an exchange of learning, knowledge and new ideas that spilled over into other areas of life and living. Original generation time 1.2786 seconds. Cache Loaded in: 0.0005 seconds.